Allows calculations involving both states and scalars. $\psi$: State - Can be used as "s1" in the expression. $\psi$: State - Can be used as "s2" in the expression. 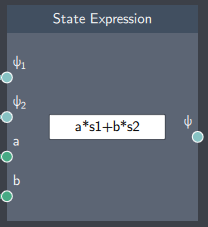 $\psi$: State - The mixed state generated from the expression. Allowed inputs into the expression-field are referenced on the Expressions-page. Unlike some other expression-nodes, this node does not have a direct dependence on a spatial dimension x, and so does not have access to several functions such as box or step. Also, this node does not have an option to automatically normalize resulting states.